The above details of cooperation and interaction between the churches of the New Testament are descriptive of what happened at that time. The question that now needs attention is this: ought the Lord’s churches today also to cooperate with one another? We look at the question first from a doctrinal point of view, and then from the angle of the communion of saints. The Lord has revealed in Scripture various characteristics of Christ’s church. We confess this aspect of God’s revelation in the Nicene Creed, with the words that “I believe one, holy, catholic and apostolic Church” (Book of Praise, p. 438). Various texts from Scripture compel us to view the Church as one. Matthew 1:21: the angel told Joseph to “call His name JESUS, for He will save His people from their sins.” Jesus did not come to save individuals, so many islands in a big sea, but a people. Note the singular; this is one people. Acts 15:14: James draws out the unity of God’s own, when he says: “Simon has declared how God at the first visited the Gentiles to take out of them a people for His name.” The saved are not unconnected individuals, but are together a distinct people. 1 Corinthians 10:17: with reference to the Lord’s Supper the apostle Paul says, “For we, though many, are one bread and one body; for we all partake of that one bread.” Note that the “one bread and one body” of which the apostle speaks comprises more persons than simply the members of the church of Corinth, for he uses the word “we” – and so includes himself, though he was not a member of the Corinthian congregation. Ephesians 4:4-6: here this unity comes out in all its strength: “there is one body and one Spirit, just as you were called in one hope of your calling; one Lord, one faith, one baptism; one God and Father of all, who is above all, and through all, and in you all.” First and foremost, there is a spiritual bond between all the churches. They have all heard the one Gospel. Through the activity of the one Holy Spirit one faith was worked in all their hearts. The unity of the Spirit was there and therefore Paul urged the Ephesians in vs 3 to hold on to it: “endeavouring to keep the unity of the Spirit in the bond of peace.” The gift of unity contains within itself the mandate to maintain the unity. All the churches of Christ share in the same sanctifying work of Christ’s Holy Spirit; they are all holy. The fact that one Holy Spirit works the same sanctification in all the churches draws out the unity that exists between these churches. James 1:27: James addresses numerous churches with his one letter (he writes “to the twelve tribes which are scattered abroad” ), and instructs all “to keep oneself unspotted from the world.” Holiness cannot characterise just one local church, but must characterise all since the numerous local churches are united by the one work of the one Holy Spirit. Genesis 22:18: God said to Abraham: “In your seed all the nations of the earth shall be blessed….” The Gospel will be of advantage to people of every tribe and tongue and nation. Psalm 87:14: by the election of God, persons from, Rahab (Egypt), Babylon, Philistia, Tyre and Ethiopia all have their spiritual roots in Jerusalem, the city of God. The Lord has revealed that His one Church, in whatever locality it may be gathered on the face of the earth, believes the same doctrine. This doctrine has come to us from God by means of the apostles. It is because God has revealed one gospel that Paul could instruct the saints at Colossae to see to it that his letter to the Colossians “is read also in the church of the Laodiceans, and that you likewise read the epistle from Laodicea” (Colossians 4:16). The one truth is valid for all the churches. That explains too why James could write one letter “to the twelve tribes which are scattered abroad” (James 1:1). The “twelve tribes” is Old Testament language to describe the New Testament Israel, the Church. There is one truth, one message valid for all the churches of Christ, and this one truth forms the basis of the bond between all the churches. The notion that there is no room for churches to exist independently from each other can also be drawn out from the angle of the communion of saints. In Proverbs 11:14 and 15:22 Solomon advises, “Where there is no counsel, the people fall; But in the multitude of counsellors there is safety…. Without counsel, plans go awry, But in the multitude of counsellors they are established.” In other words, rather than tackle problems on your own, one ought to seek advice from others in order to make a wiser and more informed decision. For finite and sinful people in this broken world, seeking advice from others is necessary; it is equally necessary for a local church, for the same reasons, to seek input from other churches in facing the challenges on its path. Philippians 2:3,4 instructs persons to reach out to others. “Let nothing be done through selfish ambition or conceit, but in lowliness of mind let each esteem others better than himself. Let each of you look out not only for his own interests, but also for the interests of others.” In the brokenness of this world, it is equally necessary that each church look to the interests of other churches and offer assistance in the struggles of this life. 1 Corinthians 14:36: in Corinth women were being permitted to speak in Church. Paul wanted to show the church of Corinth that this was incorrect. To do so he appeals to practices elsewhere: “did the word of God come originally from you? Or was it you only that it reached?” That is: the gospel began in Jerusalem, and in that church the women did not speak in church. So one church is held up as an example for another church as to how God wished to be worshipped. The Lord has saved a people for Himself, and in view of Satan’s constant attacks on the redeemed, plus the weaknesses that continue to hamper the redeemed, God’s people cannot afford to stand independently of each other as so many individuals. Christians need each other. Churches need each other as well. We need, therefore, to guard against the danger of independentism, the thought that we can do it alone. This is not how Christ would have it. All the churches have received the same Gospel and all have received the grace needed to be able to help each other. This is true for us as churches within the one country, but by extension this also applies to us as churches on an international level. The bond that exists between the churches is the fact that all are saved by one Christ. Each church is His church, and therefore each church has a bond with the church of the next locality. Admittedly, in the Bible we do not read of churches forming a bond or a federation. But that need not surprise us, for a bond is an organisational expression of an existing unity, and it takes time for such an organisational expression to come into being. Nevertheless, it is a very scriptural thought that all God’s churches be bonded together. Though many miles or different cultures may separate the churches, that does not take away from the fact that there exists a bond, a unity. Such a bond is expressed through the formation of, and the interaction of churches within, a bond such as the Canadian Reformed Churches, the United Reformed Churches, or the Free Reformed Churches of Australia (to mention just three). This bond is also expressed by establishing sister relations with federations of churches elsewhere in the world. From the above, it follows that forming and joining a bond of churches is an act of obedience to the Lord. The Lord gives no option; His churches are obliged to federate together. On the other hand, no one can compel a church to join a bond of churches. Seen from that angle, forming or joining a bond of churches is totally a voluntary matter. I grant that this may well sound like a contradiction. To show that it is not a contradiction, I refer to an example from Scripture on an entirely different topic. Paul writes to the Corinthians about collecting money for the saints in Jerusalem. “Now concerning the collection for the saints, as I have given orders to the churches in Galatia, so you must do also…” (1 Corinthians 16:1-3). Paul’s reasoning is this: since the saints in Corinth and the saints in Jerusalem are equally the fruits of the work of one Holy Spirit, giving financial assistance to each other is at bottom not voluntary; rather, it is mandatory (“must do”). At the same time, though, Paul says, “I speak not by commandment, but I am testing the sincerity of your love by the diligence of others. For you know the grace of our Lord Jesus Christ, that though He was rich, yet for your sakes He became poor, that you through His poverty might become rich. And in this I give advice ….” (2 Corinthians 8:8-10). So: Paul does not ‘lay down the law’ on the Corinthians in the matter of giving for others; he gives his “advice”. But, he says, it’s an advice the Corinthians “must” accept. That is: though Paul could not compel them or make them give, yet before God it remained their duty to give. Likewise, no church can compel another church to join a bond of churches. This is a decision each church must make for itself. However, the criteria on which a church is to base its decision can only be the revealed Word of God. And that Word draws out that there is a Scriptural imperative to voluntarily federate with other churches of Jesus Christ. Any church which federates with other churches acknowledges thereby that it accepts other churches in that bond as churches of Christ. That recognition of each other as churches of Christ obligates each to stand by the other churches no matter what happens, and to give whatever assistance may be required, be it financial help, spiritual help, or help by way of admonition. How it is that churches go about helping each other has been written down in the Church Order. Each church then which joins the bond promises to maintain and abide by the Church Order. This is no empty promise, for a Christian is bound to keep his word (Psalm 15). So the church in one city can therefore expect the church in another city to speak up and tell it when it goes astray, or expect help from other churches should it run into financial difficulty. As brothers in the Lord we are always to be ready to come to each other’s aid. This is true with neighbouring churches in a locality; it is equally true of churches throughout a country and even internationally. 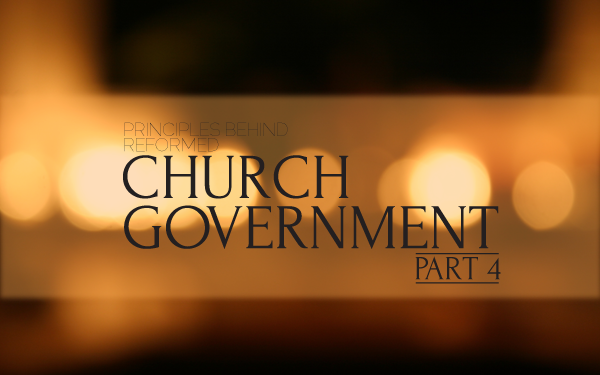 This article concludes a 4 part series on Church Government.